The Eurasian Coot is recognised by its snowy white bill and forehead shield. The remainder of the bird is dark sooty grey, except for its bright red eye. Immature birds are generally paler than adults with a white wash on the throat. Nestlings are downy, black with fine yellow tips. The head is orange-red and the bill is red with a cream-white tip. The only bird with which the Eurasian Coot can be confused is the similarly sized, dark grey Dusky Moorhen. These species are often found together, but the Dusky Moorhen has a reddish-orange head shield and bill, with a yellow tip. The Eurasian Coot ranges from Eurasia to Indonesia, New Guinea and Australia. In Australia the Eurasian Coot is common in suitably vegetated lagoons and swamps. Birds are less common in the north and in the drier regions. Food is mainly obtained during underwater dives, lasting up to 15 seconds and ranging down to 7 m in depth. Birds also graze on the land and on the surface of the water. 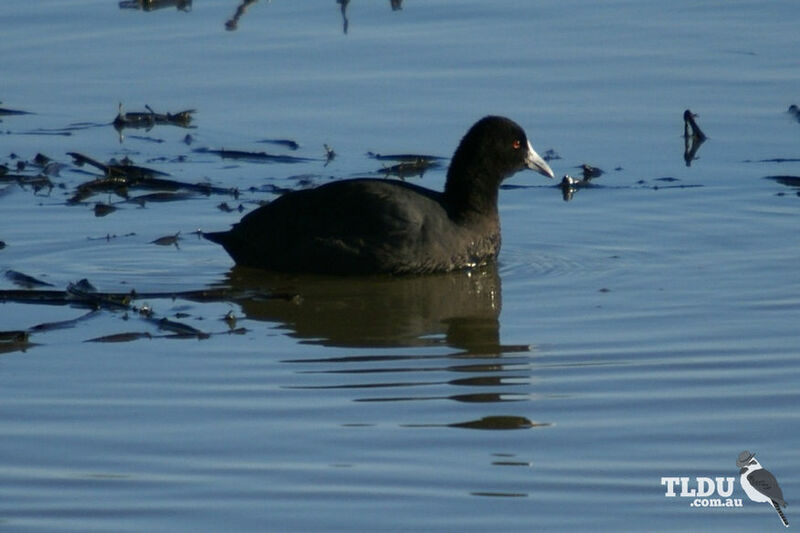 In Australia, Eurasian Coots feed almost entirely on vegetable matter, supplemented with only a few insects, worms and fish. Birds of the northern hemisphere tend to take much more animal prey. Eurasian Coots may breed at any time that conditions are favourable, and may produce successive broods. During the breeding season pairs establish and maintain territories with vigour. Their aggression is also extended towards other species. Nests of ducks are often seized and used as roosting sites, the unfortunate owner's eggs being pushed off into the water. Young ducks and grebes are sometimes killed. The nest is often a floating raft of vegetation or is built on logs or tree stumps that are surrounded by water. Both sexes share incubation and care of the young. If food becomes scarce, the young birds may be killed by the parents.